Here it is! The beast that has consumed my crafting life since Christmas! And of course, I couldn't put this loveliness in Layla's yellow baby room. So, we had to buy a new bed and throw on a new coat of paint - and what else, purple! Her favorite! Here is a look at the rest of the room. Photo is "Layla" by my lovely friend Jill. Usually about 20 more stuffed animals live on the bed...we compromised. Hard to see, but there are sparkly butterflies hanging from the windows...love them! This has been a project months in the making, literally. I think I started this last spring or summer. Firstly, let me say: I am NOT a quilter. I pretty much made up what I was doing as I went along and asked for advice from some friends and the local quilt shop when I needed input. I am sure that real quilters would be disturbed by some of my methods. That being said. Here is how I did it...and I apologize there aren't pictures of everything, but I did my best. To save money, I started out with a king size white sheet for the front of the quilt (this was too much...a queen will do). I looked several places online to find dimensions of quilts and I averaged them out and made mine 70" x 86" and it works great on Layla's twin bed. Cut your sheet to these dimensions. Put aside. Get out your lovely fabrics. Next, iron your interfacing onto each of your coordinating fabrics (the back, obviously). Start with 1/2 yard of each fabric...you can always make more later if you need to (I used 35 of each fabric). How many you are going to need is going to depend on the spacing you choose (there are 208 on this one). Now we are ready to start tracing out our circles. I don't have a circle cutter, so I used a CD as a template. I traced circles on each fabric and cut them immediately so that my pen wouldn't disappear first. Be precise when you cut your circles because there is no way to hide uneven edges! Your circles will look like this. This is the part that is very unconventional. Get out the sheet that you cut previously. We are going to use it in one piece...we are not making blocks. Now start laying out your circles. I completely eyeballed this since I am pretty good at that. If you are more comfortable measuring, by all means do that. This quilt has 16 circles on the length and 13 circles on the width. They are about 1/2" apart. I would leave 1" around all of the edges so that you have enough room for your binding. We are going to attach the circles with safety pins for now. I recommend only attaching about 20 at a time. I found that this was pretty easy to work with. It gets tricky if you have too many. Now start sewing on your circles. I used a zig-zag stitch in purple thread. This is the part that took me months and months because I just did a few circles here and there and it was never really in the forefront of my mind. It certainly doesn't need to take that long. You should have something that looks like this when you are complete (ignore the extra fabric...not yet trimmed in this picture). For the back, I used a purple sheet. I did not pre-cut the sheet. Instead I laid it out flat and then put the batting on top and then finally the quilted top on that. Once I was sure everything was all smoothed out and even. I pinned all around the edges. Once I did this, I loosely cut both the batting and the backing...not worrying too much if there was still a bit of excess. Now comes the quilting. And yes, I was able to do this on my home machine. I'm not sure that I would want to do much bigger of a quilt on this machine, but it worked out fine for a twin. I used the Quilting Foot that came with my machine (not the Walking Foot). Be sure to lower your feed dogs so that you can move the quilt about freely on the machine. I started in the middle of the quilt and worked my way out. Depending on what colors you choose, you may want to quilt the background one color and the circles another. This is what I did. I just did a free form loop-de-loop pattern. It is really quite small on the background since I had to go through a lot of tight spaces. But, I did it much bigger inside the circles. This does make the back of the quilt multi-colored, but I don't really want anyone looking at the back anyways (that's where all my mistakes are hiding). Once you are done quilting, which, if you do like me, will take you quite a while, you need to trim up the edges so that all three layers are perfectly even. Now you are ready to start binding. Everyone told me that I had to make my own binding and then after they told me how to do it, I realized that all I would be doing was making bias tape. So, why not just use bias tape? Since I just wanted solid white, that's what I did. I used 9 yards of extra wide double fold bias tape. If you look at bias tape, you'll notice that one side is longer than the other. You want the long side to be on the back of your quilt. Unfold the bias tape and sew down the inside flap of the long side to the back of your quilt. I found it easiest to do one side at a time. Now fold you bias tape back up and over to the front side. Sew all the way down the side you just worked on making sure to "catch" the bias tape on the back. Since we are doing one side at a time, you will want to finish the corners as you go. You can either miter the corners or you can do them square. I played around with it and decided that I liked them squared the best. Just fold over your ends and then overlap them in a square. Sew down. And that's it. Time to celebrate with a cocktail because you seriously deserve it. Please let me know if you try this and of course send me pics!!!! That could be from pottery barn! I can't believe how amazing that turned out! This is so pretty. I just bought purple and pink bundles for my granddaughter as they are her favourite colours. This just might be the pattern I'm looking for. I'm rather a novice, as I just finished up a quilt before Christmas that I started in 1980! Thanks for sharing. Don't feel bad about taking a LONG TIME to finish up a quilt. 1) I started our 1st daughter's quilt (for her hope chest) when she was 3. 2) She got it on their 10th wedding anniversary! I am still handquilting hubby's and my quilt that I pieced in 2006.....been quilting on it ever since and still lack 2 LONG rows being done PLUS the border on this QUEEN SIZED quilt. beautiful! I'm totally admiring your stippling too. Free motion quilting scares me. I did want to mention that there's no absolute rule that your bobbin thread has to match the top thread. If you want all purple on the bottom of the quilt, then just don't change the bobbin thread when you change the top thread. Sometimes the different color will show just a tad on the other side, but you just need to adjust your tension to compensate. Wow, This is just an eye candy, lovely quilt! Love the colors you chose so much and it is giving me the itch to do something similar for my 2nd daughter's bed when I finally finally finish the duvet for my 1st daughter's bed. Love the quilt! My favorite colors too! I absolutely love that you did this using your imagination and some inspiration. Even if it's not the way "real" quilters would do it I think it is amazing and the quilt turned out beautiful! Okay, I think I can do this! I am not a quilter, but do some sewing and just want a trow quit for the end of my bed. This is fun and doable. Thanks! Very useful tips for make your home more attractive with extra long twin sheets style. I think that is so great! Thanks for the information on topics.I was excited by this article. How fun to read about your creative process! I too was drawn by the Johanna quilt, back when the version had a white background. I'm still working on it--have made it in pieces, 6 rectangles, 5 by 6 circles each. Once it's joined I'll add a border (the width of a circle) all 'round. I'm doing it by hand, so it's very VERY slow. But I'm having lots of fun. Perhaps I'll figure out how to send a pic. when it's finally done. It's been great for traveling. Hope your little one appreciates the lovely quilt you made for her! You have inspired me! I will now go through my stacks of fabrics I have been collecting, just waiting for the perfect inspiration to use them. You have given me that inspiration! 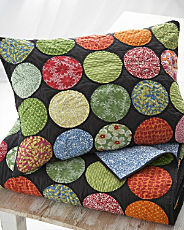 I am not a quilted as of yet, been studying, reading and researching before I jumped into making a quilt! For the past 4 months I have read everything I could get my hands on regarding quilting, so I suppose the time has come to jump in with both feet! I plan on making your quilt but with a variation suitable for a baby boy ( my step sister just had a new baby boy on Monday June 2, 2011) my first ever quilt will be made for him! I will add flannel for the backing to be soft and cozy! I will also use bright primary colors for the circles to match his nursery. Well, there's no time like the present! Let's go quilt! I will send you pictures when I'm finished!! Featuring your quilt on my blog! Such an awesome idea for someone that wants the quilt look but no piecing required! LOVE LOVE!!!!!! This is so 'cool' both in color and design. How neat to come up with the idea of using a CD for your circle pattern, you can cut a bunch with that, perfect template. You are so creative and I agree with the person that said it looks good enough for Pottery Barn. I will take it a step farther, something you would think to find in Macy's or Pier One Imports. Classy! did you cut the circles out with scissors or a rotary cutter? love the quilt and think i might do something similar for my daughter! Well I can see how it would have driven you bonkers, but oh my what a gorgeous result. I have three baby quilts to make and a toddler one. This one is perfect for the toddler and my stash needs some thinning out. Thank you for a beautiful wonderful idea.